Just turn of the lights? or... Well, well, how about try sitting in the dark with friends, family or love ones and enjoy your sipping Frappucino ~ blissfull. 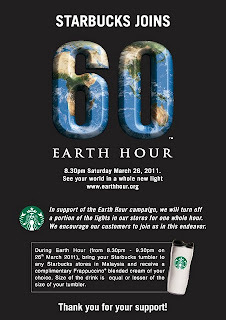 In support of the Earth Hour campaign, Starbucks will turn off a portion of the lights in their stores for one whole hour... so romantic with coffee aroma... mmm... During Earth Hour tomorrow from 8.30pm - 9.30pm, bring your Starbucks tumbler to any of their stores in Malaysia and receive a compimentary Frappuccino blended cream of your choice. 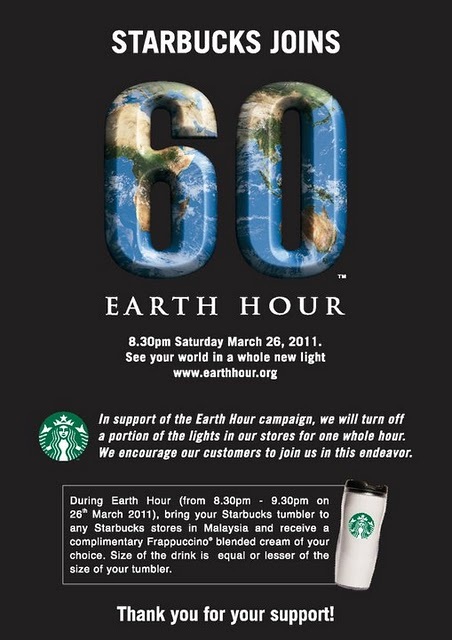 Price of the Starbucks Tumbler start from RM38 and above. I am a coffee lover but I can't drink any coffee or tea after 5pm if not I can't sleep. Tomorrow night, I'll will be hanging out with friends at cafes. Hope you all have a nice and fun weekend.